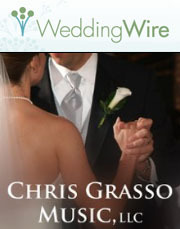 Chris is a Washington, D.C.-based jazz pianist who specializes in working with vocalists. He is the Music Director for Sharon Clark, one of DC's most in-demand jazz vocalists. They can be seen and heard performing regularly at Mandarin Oriental, Washington D.C., and have appeared together on many stages, from the National Mall, as part of the Duke Ellington Jazz Festival, to the Cape May Jazz Festival. 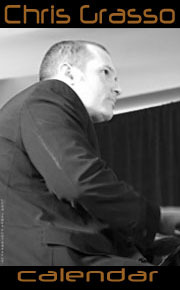 Chris has performed with Denise Thimes, Matt Wilson, Avery Sharpe and Albert Rivera, closing the show after Dave Brubeck’s performance at the 2010 Litchfield Jazz Festival. He has performed live on WPFW, Washington, D.C.'s jazz station, with jazz greats Keter Betts and Buck Hill. He has appeared with the Ken Peplowski/Chuck Redd Quartet, and with New Orleans' historic jazz family, the Jordans. Chris has made multiple appearances at what was formerly the the East Coast Jazz Festival, and continues the tradition through what is now the Mid-Atlantic Jazz Festival. He has performed at a number of closed historical venues like the One Step Down and the Smithsonian Jazz Cafe in DC. He continues to perform at major venues in the Washington, D.C. area, including Blues Alley, Twins Jazz, Bohemian Caverns, the Kennedy Center, and the Music Center at Strathmore. Chris serves as Music Director for Mandarin Oriental, Washington D.C., and performs regularly with a number of local vocalists such as Sharon Clark, Lena Seikaly, Kristine Key, Sara Jones and others. 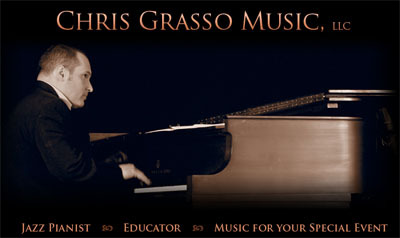 Chris Grasso is a Washington, D.C.-based jazz pianist who specializes in working with vocalists. He is the Music Director for Sharón Clark, one of DC's most in-demand jazz vocalists. They can be seen and heard performing regularly at Mandarin Oriental, Washington D.C., and have appeared together on many stages, from the National Mall, as part of the Duke Ellington Jazz Festival, to the Cape May Jazz Festival. 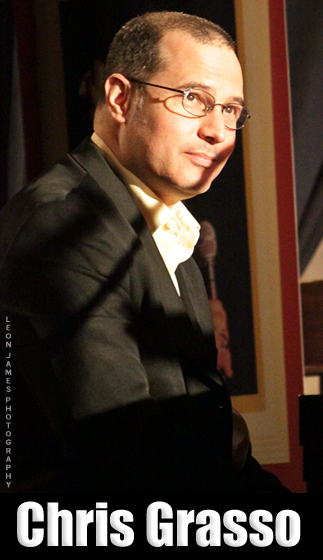 Chris has performed with Denise Thimes, Matt Wilson, Avery Sharpe and Albert Rivera, closing the show after Dave Brubeck’s performance at the 2010 Litchfield Jazz Festival. He has performed live on WPFW, Washington, D.C.'s jazz station, with jazz greats Keter Betts and Buck Hill. He has appeared with the Ken Peplowski/Chuck Redd Quartet, and with New Orleans' historic jazz family, the Jordans. Chris has made multiple appearances at what was formerly the the East Coast Jazz Festival, and continues the tradition through what is now the Mid-Atlantic Jazz Festival. He has performed at a number of closed historical venues like the One Step Down and the Smithsonian Jazz Cafe in DC. He continues to perform at major venues in the Washington, D.C. area, including Blues Alley, Twins Jazz, Bohemian Caverns, the Kennedy Center, and the Music Center at Strathmore. Chris serves as Music Director for Mandarin Oriental, Washington D.C., and performs regularly with a number of local vocalists such as Sharón Clark, Lena Seikaly, Kristine Key, Sara Jones and others.